Mr. Nitin Jain (Chief Marketing and Sales Officer, OCM) visited IIM Kashipur on 29th Nov and shared his experience in marketing and brand building in the textile industry. Mr. Jain has a vast experience spanning 15 years working with companies such as International Textile Group (ITG), Burlington Industries (now ITG) in United States and Nano- Tex in Hong Kong. He has also worked with Raymond (India) as President, Strategic Initiatives and has a keen interest in equity trading. He started off the interaction by clearing some of the myths related to marketing. He briefed the students about the recent change in guard at OCM, and how it led to a rebranding exercise in view of OCM shifting its focus away from the ready-to-wear segment. The rebranding of OCM as “An affordable fashion for aspirational minds” and the ‘Face life’ campaign generated interest among the students. Participants discussed the finer aspects of the ad campaign and became curious as to why OCM moving away from using any brand ambassador. The suiting offered by OCM come in a huge price window and catering to the age group of 25 yrs to 35 yrs. Students were inquisitive about the go-to-market strategy of OCM to which Mr. Jain highlighted that Single brand retail stores were not cost effective hence they moved on to Multi brand outlets as their primary customer touch point. This strategy helped OCM in catering to the tier 2 and 3 cities. The discussion was followed by the one to one interaction with the guest. The students picked his brain with queries from various aspects ranging from financials, operational difficulties, retail marketing and brand makeover. “Tailor made suits are the biggest challenge we face. Tailoring is a dying skill” he added when asked about the challenges faced by suiting industry. He also provided the students with the insights on OCM and its work culture. The students of IIM Kashipur enjoyed the session as it provided them with a clearer picture of what are the challenges in the textile industry and also informed about the expectations from them in the near future, if they venture into the marketing space in textile industry. The students of IIM Kashipur got an opportunity to interact with Mr. Shouvik Mukherjee, VP and Growth Unit Head at Jubilant Life Sciences. Mr. Mukherjee has a Masters degree in Agriculture and has worked with renowned firms such as Bush Boake Allen, Monsanto and also served as the VP of Agrochemical division at Sudarshan Chemicals. The session began in a very interactive manner as the students posed questions on topics such as Genetically Modified Crops and their regulation in India. In response to the questions, Mr. Mukherjee talked about the differences in marketing of agricultural products in India and abroad. He drew upon his vast experience in dealing with international markets and demonstrated the differences between doing business in India and abroad. He informed the students about the numerous avenues through which a company can acquaint itself with potential foreign clients. He stressed on using avenues like International trade fairs and Embassies of foreign countries in reaching out to clients abroad. Speaking further on trade relations with International clients, Mr. Mukherjee spoke of obstructions to free trade and the negative impact of protectionist measures in preventing the opening up of new markets. He also discussed about the exact opposite, wherein the government steps in to prevent a meltdown of the local industry in the wake of fierce and unfair competition from firms operating in other countries. Spurred on by the keen interest of the students in cases where anti-dumping duties were imposed, Mr. Mukerjee elucidated the concept with some real examples from agri-business. Some of the students questioned the nature of anti-dumping duties and pointed out that it could be construed as a form of protectionism adopted by the home country. The confusion was eliminated soon after, as Mr. Mukherjee pointed towards several cases in which significant evidence of unfair practices could be found. As the session came to a close, Mr. Mukherjee offered helpful advice to the students on building strong client relationships. He emphasized on the need to follow business etiquette in dealing with international clients and its importance in building rapport with people from vastly different backgrounds. The students of IIM Kashipur found the session very informative as it provided them with a better understanding of the life-sciences industry and also a glimpse of how global selling occurs. 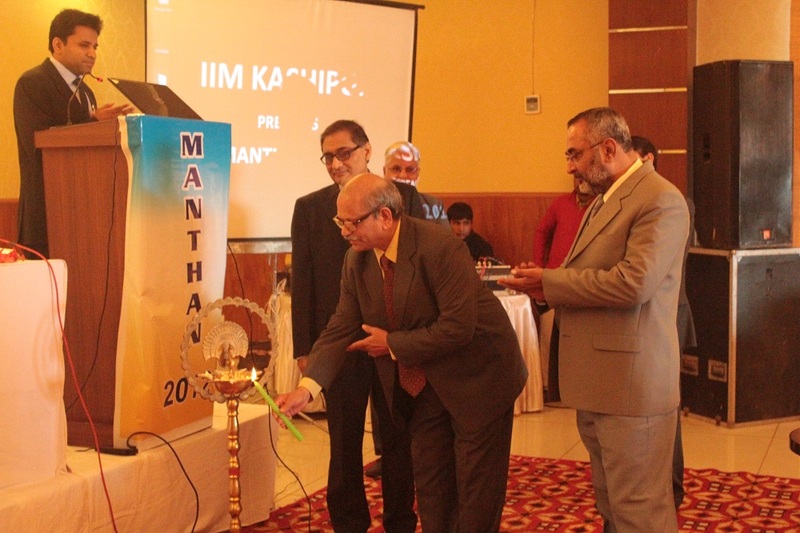 1st Dec 2012, Gautami Heights, Kashipur: Inaugurating the second annual Finance summit of IIM Kashipur, Dr.Gautam Sinha, Director, IIM Kashipur emphasized on the fact that India still faces many barriers in competition and a lot of work is required to be done for financial inclusion. According to Mr. Sinha, MANTHAN’12 aims at providing fresh ideas and insights about the needs of the present, through eye opening talks by domain experts. MANTHAN is an annual Finance Summit organized by IIM Kashipur to provide a platform for state of the art discussions on the current state and future direction of the Indian economic reforms. The event witnessed a mix of eminent industry personalities from the field of economics, academia and students. Reflecting on Indian Economic Reforms Dr. M Govinda Rao, Member, Economic Advisory Council to the Prime Minister and Director, National Institute of Public Finance and Policy said that more relaxations in service sector have made India a service centric country where less importance is given to infrastructure or power sector. He added that poor expenditure management and fiscal deficit in conjunction with election and increased petrol prices had led the deceleration of Indian economy in 2008. But at the same time he said that the repercussions can be more severe than the constructive effects of reforms such as price control by government often leads to a misallocation of resources. He emphasized on the fact that government reforms like creation of National Investment Board will be more helpful. Along with this, private sector should invest more & present a road map to government rather than reacting according to reforms. Mr. Robin Banerjee, Deputy Managing Director of Bilcare Limited stated that debt w.r.t GDP is going down (decreased from 75% in 2006 to 67% in 2012) and the country will continue to grow for at least next 5 decades because it has a median age of 25yrs. which makes it the youngest in the world. But at the same time he said that, in terms of per capita income India stands at 135th position out of 180 countries, which raises a few concern. According to him the motive of economic reforms should be targeted towards removing distortion i.e. creating policies which equally favor rich & poor people and also manage competition. He added that two basic challenges faced by India are, first, lot of paper work which causes delay in getting permission to start a project and second, contractual agreements. In terms of following contractual agreements India stands at 184th position out of 185 countries which stops foreign investors from investing in India. Few of the suggestions given by him which will decrease the fiscal deficit as well as Gini coefficient are decreasing interest rate, selling the surplus land and divestment of loss making government companies. Dr. D.S. Malik, Managing Director, Amex auto group Co., demonstrated the scenario of Indian auto industry post economic reforms. He emphasized the need of better tax policies. He also focused on labor laws that are currently practiced. Mr. Ranen Banerjee, Executive Director/Partner, Pricewaterhouse Coopers, was of the view that currently India is having weak macro fundamentals. External factors like high crude oil prices and depreciating foreign exchange rate are among the main reason. He proposed REFORM 2.0, new changes that should be the future of economic reforms in India. It included giving more choices to bottom of pyramid rather than middle class, empowering the state government so that growth is triggered by them & not by center, rule of law i.e. strengthening the judiciary & contract laws in India and focusing more on emerging concepts like impact sourcing. Dr. V. Ranganathan, Mentor Faculty at IIM Kashipur, RBI Chair Professor on Infrastructure and Member of Telecom Regulatory Authority of India said that making economic reforms are not enough, reforms in governance and attitude is the need of hour. Increasing the efficiency & response should be given more attention and reforms should not be limited only to papers but rather be implemented properly. IIM Kashipur commenced operations from July 2011. The institute offers its flagship two years Post Graduate Program in Management (PGPM). The institute is set up with the objective of providing quality management education while sensitizing students towards the needs of the society.